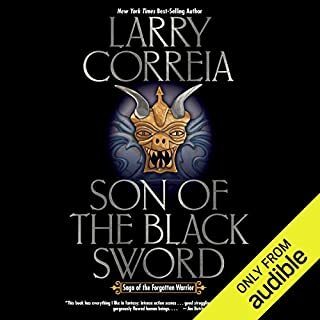 First, One of Best LitRPG. 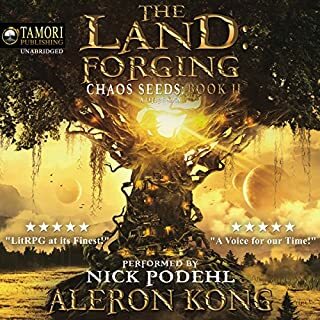 If you like LitRPG you’ll like this. If you like this you’ll like LitRPG. Fantasy in which the fantasy world acts like an RPG. I'm a fan Correia's books for just plain good exciting storytelling. This series is a bit of a departure from his typical style, but very well done. Highly recommended. 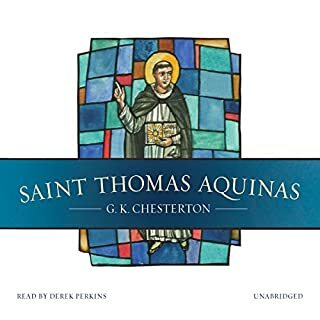 Chesterton's book is a brilliant picture of St. Thomas Aquinas. He does a masterful job of showing you Thomas the man, The Saint, The friar, and the theologian, all against the backdrop of a remarkable picture of the 13th century. It is hard to imagine a book about the Middle Ages Star in one of the most notoriously difficult philosophers to read, being a page turner that you can't put down, but that is exactly what Chesterton gives us. It is worth noting that almost all the great Thomist scholars of the 20th century, philosophers such as Jacques Maritain and Etienne Gilson, all commend Chesterton's book is the single best book to read about Thomas. This is a science fiction story that you can love with no interest in science fiction (or in science, which is very accurately presented). No, this is a human tale about courage, ingenuity, and quiet heroism. 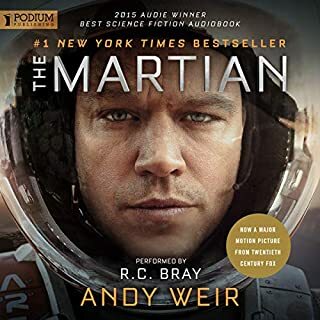 Watney's survival is never certain, but this is a deeply optimistic book that shows human beings at their best, mixing humor and plenty of suspense. The heroes we meet here are not action superstars. They are however the kind of men and women who will one day take us to Mars, and beyond. Highly recommended. 1. Book: Grade: A. An excellent series. It's lots of fun to listen too. It's action-adventure sci fi with a bit of political intrigue mixed in. 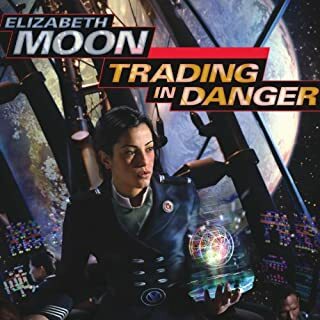 Readers will hardly be surprised to find (in Elizabeth Moon) a young hero, unfairly disgraced, who must now prove herself -- and in the process learn who she is and what she is capable of -- against overwhelming odds. As usual, Moon gives us plenty of female characters who are not one-dimensional cardboard cut-outs, as is all too common in fantasy and science fiction. If you enjoy strong female protagonists, Moon is for you. Note: It's also true that this is no "Deed of Paksenarrion," but given that that was Elizabeth Moon's "home run" and one of the best fantasy novels of the past 50 years, the comparison isn't really fair. "Deed" is on the short list of top fantasy I recommend to people, along with things like Lord of the Rings, Chronicles of Thomas Covenant, and Song of Ice and Fire. 2. Reader: Grade: A/A-. Audiobook listeners look for two things in a reader, skill and a "good fit" with the book. In my opinion Cynthia Holloway satisfies both very well. She does sound young, but the protagonist is young. I think her "fit" this series is very good, and I hope of Brilliance does any of Moon's other sci fi series (like the Esmay Suiza series), that Holloway does the reading for that too. The complaint that she "can't do male voices," doesn't seem to me to amount to more than her not sounding male -- but so what? Think of a top reading like George Guidall trying to "do" female voices. Not going to happen. It is not long before the survivors, outlaws, renegades, and carrion eaters start to gather, picking over the bones of the dead and fighting for the spoils of the soon-to-be dead. Now in the Seven Kingdoms, as the human crows assemble over a banquet of ashes, daring new plots and dangerous new alliances are formed, while surprising faces, some familiar, others only just appearing, are seen emerging from an ominous twilight of past struggles and chaos to take up the challenges ahead. Roy Dotrice is makes SO MUCH difference! 1. Review of the READING: (1 star) John Lee is simply not as good as Roy Dotrice, not nearly, and this is compounded by the fact that Dotrice is so very versatile and had established easily identifiable voices for almost every character, even minor ones! (For example, the gloomy black brother, Dolorous Edd -- hilarious when Dotrice voices him, completely indistinguishable from other characters when Lee voices him). And when it comes to MAJOR characters like Samwell or Jaime, this is catastrophic. Random House Audio has done the equivalent of making the next Harry Potter movie with an entirely new cast of actors -- it wouldn't MATTER if the new actors are as good (in this case, they aren't) or that the script is still great, these AREN'T the characters we know! Please, please, please, please Random House, bring back Roy Dotrice! 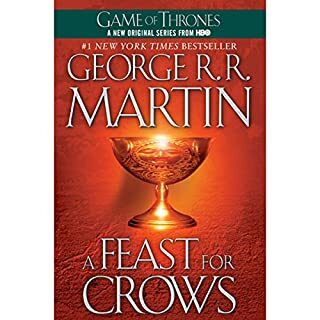 2. Review of the BOOK: As part of the overall story of a Song of Ice and Fire, A Feast For Crows continues to be excellent (5 stars). However, when Book 4 started to become too long, Martin decided to split it into TWO BOOKS, each of which would treat different point of view characters. He made a decent case for doing this at the time, but book 4 came out in 2005. And now it's nearly 2011 and still no book 5! Six years and counting we've been waiting to find out about Tyrion and many other of our favorite characters. (1 star for that).